, a very learned writer, was born in Germany, at a town in the neighbourhood of Heidelberg, in 1577. His father was a native of Ruremond; but, upon embracing the reformed religion, left that place, and went into the Palatinate, where he studied divinity, and became a minister in 1575. He removed to Leyden the year after this son was born, and was admitted a member of the university there, but finally settled at Dort; where he buried his first wife, married a second, and died about three months after. 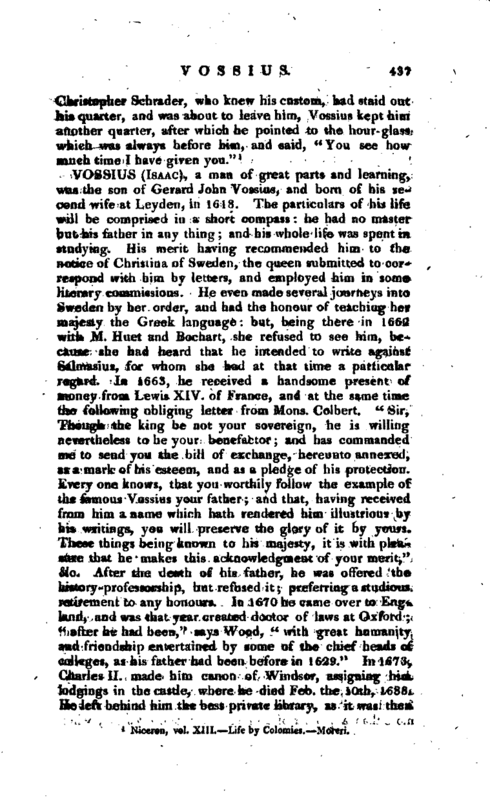 Gerard John Vossius was only in his eighth year when he lost his father; and the circumstances in which he was left not being sufficient to procure an education suitable to his very promising talents, he endeavoured to make up for this defect by assiduity and unwearied application. He began his studies at Dort, and had Erycius Puteanus for his school-fellow; with whom he ever afterwards lived in the closest intimacy and friendship. 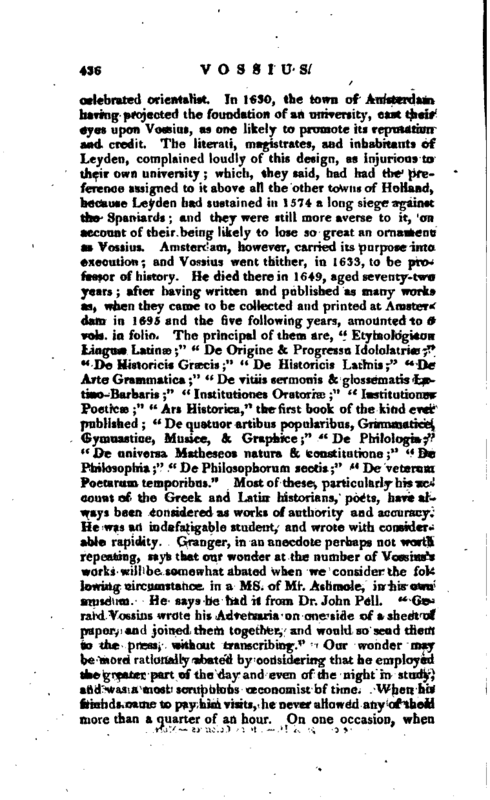 Here he learned Latin, Greek, and philosophy; and in 1595, went to Leyden, where he joined mathematics to these studies, and was made master of arts and doctor in philosophy in 1598. He then applied himself to divinity and the Hebrew tongue; and, his father having left him a library well furnished with books of ecclesiastical history and theology, he early acquired an extensive knowledge in these branches. 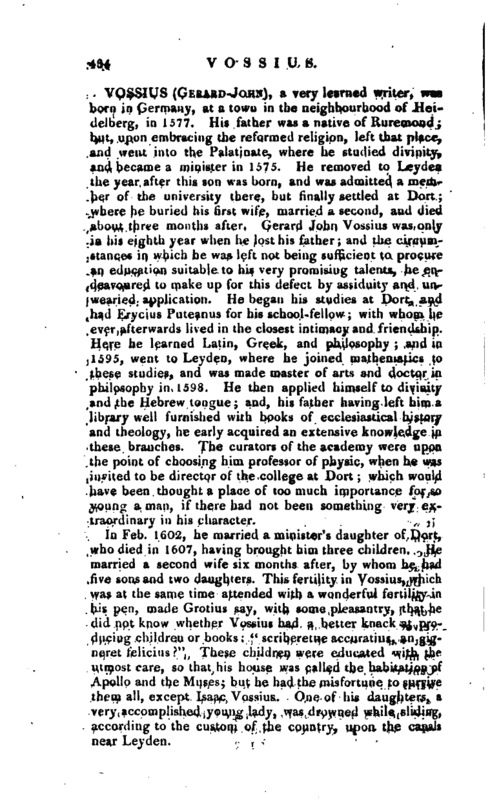 The curators of the academy were upon the point of choosing him professor of physic, when he was invited to be director of the college at Dort; which would have been thought a place of too much importance for so young a man, if there had not been something very extraordinary in his character. In Feb. 1602, he married a minister’s daughter of Dort, who died in 1607, having brought him three children. He married a second wife six months after, by whom he had five sons and two daughters. This fertility in Vossius, which was at the same time attended with a wonderful fertility in his pen, made Grotius say, with some pleasantry, that he did not know whether Vossius had a better knack at producing children or books; “scriberetne accuratius, an gigneret felicius. ?” These children were educated with the utmost care, so that his house was called the habitation of Apollo and the Muses; but he had the misfortune to survive them all, except Isaac Vossius. One of his daughters, a very accomplished young lady, was drowned while sliding, according to the custom of the country, upon the canals near Leyden. | In 1614, an attempt was made to draw him to Steinfurt, to be divinity-professor there; but the university of Leyden having named him at the same time to be director of the theological college which the States of Holland had just founded in that town, he preferred the latter situation; and his office of professor of eloquence and chronology, which was conferred upon him four years after, was peculiarly agreeable to his taste. Though he took all imaginable care to keep himself clear from the disputes about grace and predestination, which then ran high among the ministers of that country, yet his precautions did not avail, for he was entangled in spite of them. He had rendered himself suspected and obnoxious to the Gomarists, who had prevailed in the synod of Dort held in 1612, because he had openly favoured the toleration of the Remonstrants, and because, in his history of the Pelagian controversy, printed in 1618, he had affirmed, that the sentiments of St. Augustin upon grace and predestination were not the most ancient, and that those of the Remonstrants were different from those of the Semi-Pelagians. And although he did not separate himself from the communion of the Anti-Remonstrants, yet they, knowing well that he neither approved their doctrines nor their conduct, procured him to be ejected from his professorship at the synod of Tergou, held in 1620. 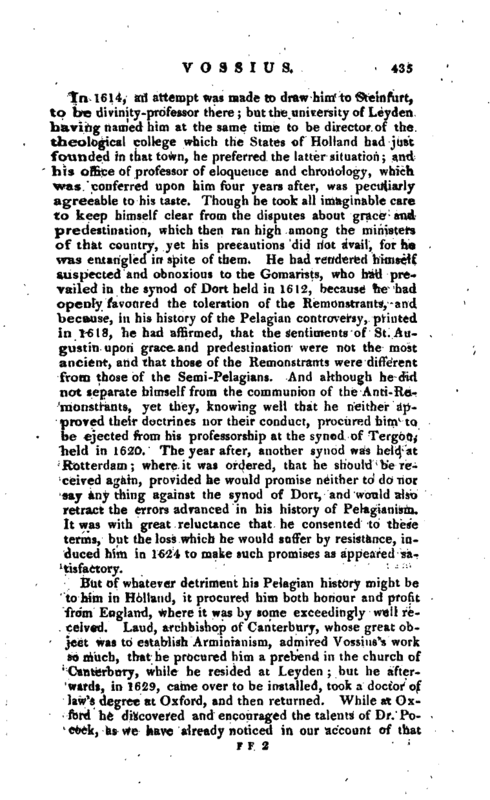 The year after, another synod was held at Rotterdam; where it was ordered, that he should be received again, provided he would promise neither to do nor say any thing against the synod of Dort, and would also retract the errors advanced in his history of Pelagianism. It was with great reluctance that he consented to these terms, but the loss which he would suffer by resistance, induced him in 1624 to make such promises as appeared satisfactory. Niceron, vol. XIII. Life by —Colomies.—Moreri.